"The child is father to the man." That’s me in the orange safety vest, walking on a glacial moraine in the northern foothills of the Brooks Range, Alaska. I’m there to provide a scale for the photograph, which was one of my most frequent tasks as a field assistant working in this treeless world. I considered myself lucky to be able to get paid to work in such a spectacular landscape for the 1974 and 1975 "field seasons," during which my boss (geologist Thomas D. Hamilton) and I mapped the surficial materals of the Chandalar, Phillip Smith, and Sagivinirktok quadrangles at a scale of 1:250,000. We worked for the U.S. Geological Survey, using helicopter-assisted foot traverses six days a week. Each of these quadrangles was the size of Connecticut, where I now live and work. It was Hamilton who took this photograph. He had been my M.S. graduate advisor at the University of Alaska, though he left midway through my program to join the U.S. Geological Survey. 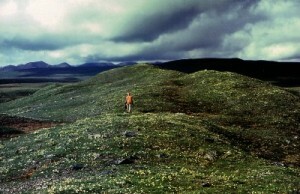 Three decades later, another geologist named Rod Combellick, published Hamilton’s photo as the cover image for Professional Report 121 of the Alaska Division of Geological & Geophysical Surveys (2003). I was lucky to have been Rod’s M.S. graduate advisor at the University of Alaska, where I taught in Hamilton’s former position. In this case, the academic "grandfather (Hamilton) " benefited by having a photo of his academic "son" (Thorson) published by his academic "grandson" (Combellick). There’s a fourth generation of academic mentorship here as well. In the late 1960s, a geologist named Robert Black was teaching at the University of Wisconsin in Madison. There, he served as the M.S. graduate advisor for Thomas Hamilton, who originally hailed from Essex, Connecticut named. Black later moved from Wisconsin to Connecticut in 1973. Thirty years later, Black attended a workshop on glacial geology that Hamilton and I had organized at Chena Hot Springs, Alaska. When driving Black back to Fairbanks to catch his airline flight, and seemingly out of the blue, he strongly encouraged me to apply for his his job at the University of Connecticut if and when he retired. A few months later, Black died unexpectedly in his sleep just before returning to the University of Connecticut following a year-long sabbatical. My circumstances changed as well: my oldest son was born seriously disabled with autism, and my wife and I decided we had to move southward. Very late in the game, and slightly after the published deadline, I happend to notice that the University of Connecticut was re-filling Black’s position. Naturally, I applied, and luckily, I was hired to replace him. When cleaning and converting his former office-lab to suit my needs, found on one of his bookshelves an original typewritten copy of Tom Hamilton’s master’s thesis (as well as one from Robert Palmquist, who taught me field geomorphology during my field school experience at Iowa State University in 1971). I set that thesis aside and hand-delivered it back to Hamilton as a gesture of appreciation for his mentorship. In this story, the academic "great grandfather" (Black), bequeathed to the "grandson" (Thorson), something to bequeath his academic "son" (Hamilton), who, by then, had become the "grandfather" of Combellick, his publisher. Educational mentorship is the gift that just keeps on giving. Photo by Thomas D. Hamilton with Robert Thorson’s camera. See text above.